On February 26, 2015 Google Announced That Mobile-Friendly Websites Will Rank Higher on Search Results. The bottom line is Google will penalize your website in the search results if it’s not mobile-friendly. 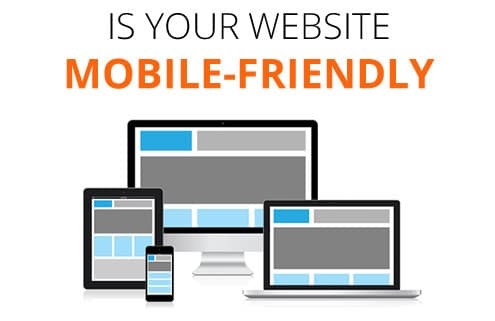 If you have good organic search rankings and your website is not mobile-friendly you can expect to rank below your competitors who have mobile-friendly websites. When Google says “Significant Impact” as they did in the above quote, it’s not something to take with a grain of salt. 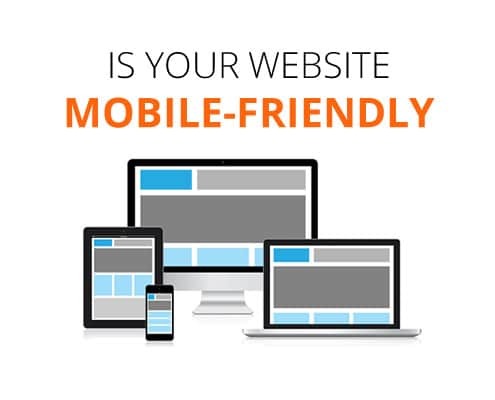 Our assumption is that all websites that are not mobile-friendly will rank below mobile-friendly websites, which means you may have a hard time getting back to page one for your organic search rankings. We don’t know how long the change will take to roll-out and how long before it impacts the search results, but now is a good time to be proactive. 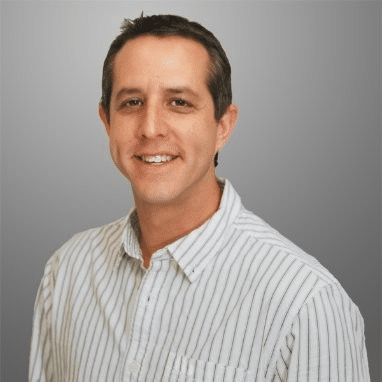 The way the update from Google is written it appears this will only impact mobile search results, but it could impact desktop searches as well. In addition searches on tablets will be impacted by the update. Don’t assume mobile search is not important for your business because it is. Mobile traffic on our website accounts for almost 20% of all our website visitors and we have been watching this number quickly grow over the years. 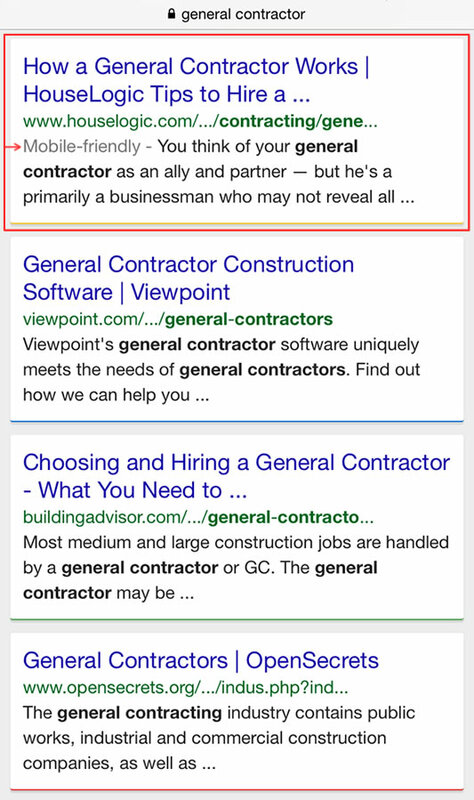 The below screenshot is a mobile search result for General Contractor, you will notice how the top site is listed as mobile-friendly and the others are not. Luckily, there is still time for you to execute a mobile-friendly website strategy but the clock is ticking. Contractor Gorilla is currently offering a FREE mobile-friendly site checkup. Please submit the form below if you would like a FREE mobile-friendly website report. Below are some tools you can use as you prepare for this big change. Don’t just assume your website is mobile-friendly because you have a responsive website, you need to make sure Googlebot sees your site as mobile-friendly. You can use your Webmaster Tools (if you have it setup) to get a full list of mobile usability issues on your site using the Mobile Usability Report. 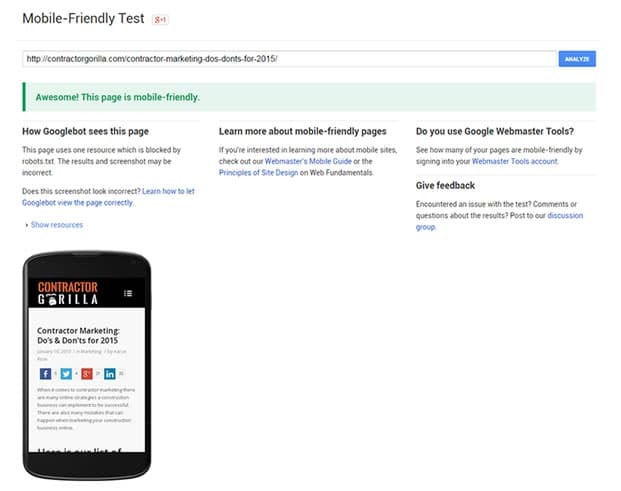 Most important, make sure to test your website to ensure Googlebot recognizes it as mobile-friendly. Below is an example of a mobile-friendly test result that passed. If you have any question or need assistance with making sure your website is mobile-friendly feel free to contact us.